The students recorded this spectrum of the disintegrating spacecraft. 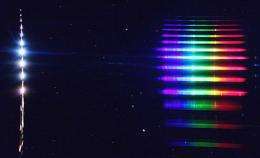 The colors reveal much about the response of Earth's atmosphere to the hypervelocity spacecraft and how the spacecraft itself was breaking up. Last year, high school science teacher Ron Dantowitz of Brookline, Mass., played a clever trick on three of his best students. He asked them to plan a hypothetical mission to fly onboard a NASA DC-8 aircraft and observe a spacecraft disintegrate as it came screaming into Earth's atmosphere. How would they record the event? What could they learn? "After the main bus deteriorated you could see the capsule still intact," says Breitmeyer. "Then the capsule decelerated, and we lost sight of it. It was over. We all started yelling and cheering - we practically rocked the plane! The same people who had been biting their fingernails minutes ago were now shouting and laughing." "Without these students, we could not have collected the level of data we got," says NASA's Peter Jenniskens, the re-entry mission's principal investigator. "I was very impressed by how well prepared they were. I'm happy about that - these teenagers will be our replacements." I agree. Learning is inherently intimate. 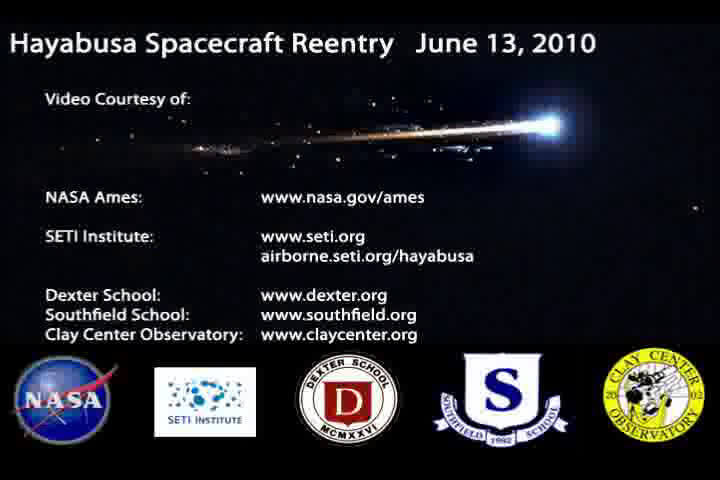 Great video, I wish I was there to see the space craft in person. Practical always beats Theory in my opinion. Well done, i am also betting that they will realise there dream one day of working for NASA or some other space industry entity.